I love that despite the proliferation of Facebook and Facebook ads in our lives there are still little Cinderella techniques that fall below the radar for most Pages and Advertisers but are pure gold for those admins who can be bothered to do the work. 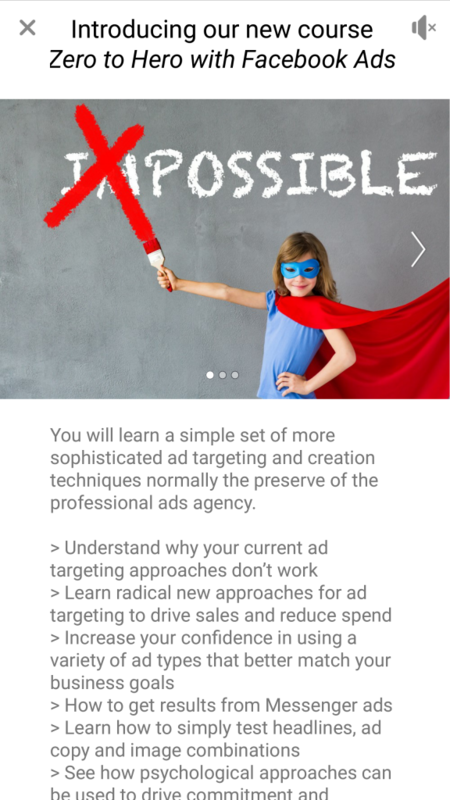 Innovative techniques tend to do well to bypass ad blindness and the incessant thumb scroll. You also find that new or unusual techniques are favoured by the Facebook News Feed and Ad algorithms. Canvas (or as they are now known ‘Instant Experience’ ads) are one such technique that enable a brand to tell a compelling story outside the confines of a typical News Feed ad. Users can enjoy a far broader understanding of the brand without having to leave Facebook to, for instance, browse a website. 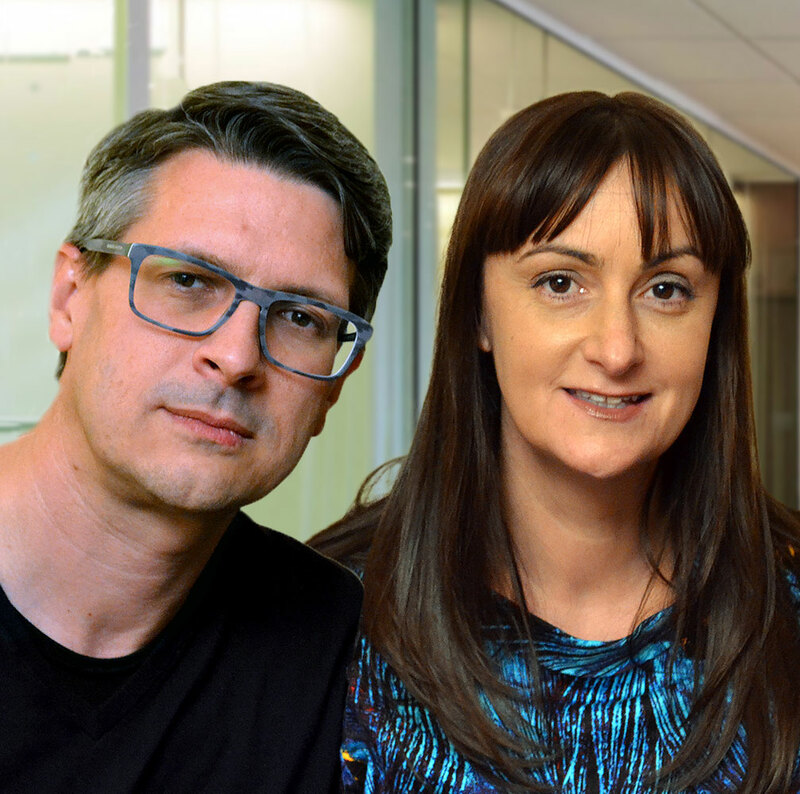 The advertiser is far more in control of the user journey displaying only the creative assets it wishes the user to see at this stage of the relationship. And one of the reasons Facebook loves them is because the user stays within the Facebook platform rather than navigating off to another website. No wonder it favours Instant Experiences over traditional link click ads. But advertisers tend to avoid Instant Experience ads them because a) They appear complicated b) Take a bit more time to set up and c) Require a few additional creative assets to really make the most of the opportunity. I do think Instant Experience ads are worth the time investment and to help you along the way Facebook have even provided some easy-to-use templates. Facebook Instant Experiences, formally known as Canvas, load instantly, they’re mobile-optimised and designed to capture the complete attention of your audience. Within an Instant Experience, people can watch engaging videos and photos, swipe through carousels, tilt to pan and explore lifestyle images with tagged products – all in a single ad. What is a Instant Experience Ad? Instant Experience ads provide an “immersive” experience with a rich media combination of images, videos, gifs, text, products, carousels all lurking under the surface of a mobile ad. As usual the idea is to keep users on Facebook, scrolling through this “canvas”of fun rather than bumping them off onto other website (and likely experiencing poor load time as part of the process). Think of them as very deep web pages on mobile with the added benefit of interaction such as panning and enlarging. And with the majority of users accessing Facebook via mobile this mobile-first ad type ought to be high on the consideration set. But with all those variables it sounds complicated right? Well actually not so much. I actually had a lot of fun experimenting with the creating an Instant Experience ad for this article and honestly, it wasn’t that complicated. I spent about an hour playing around but once I’d learnt the ropes subsequent ads could be created in minutes. The intuitive design tool lets you add in the different elements, tweak them and drag them around. If you are used to working on a CMS like WordPress, creating images with tools like Canva, building emails with programs like MailChimp you’ll find Instant Experience a doddle. And if you are too scared to jump straight in then read on for our step-by-step guide. I’ve stuck with really simply elements and functionality here with a simple ad for a new Digiterati ad. As you get more confident you can explore more. 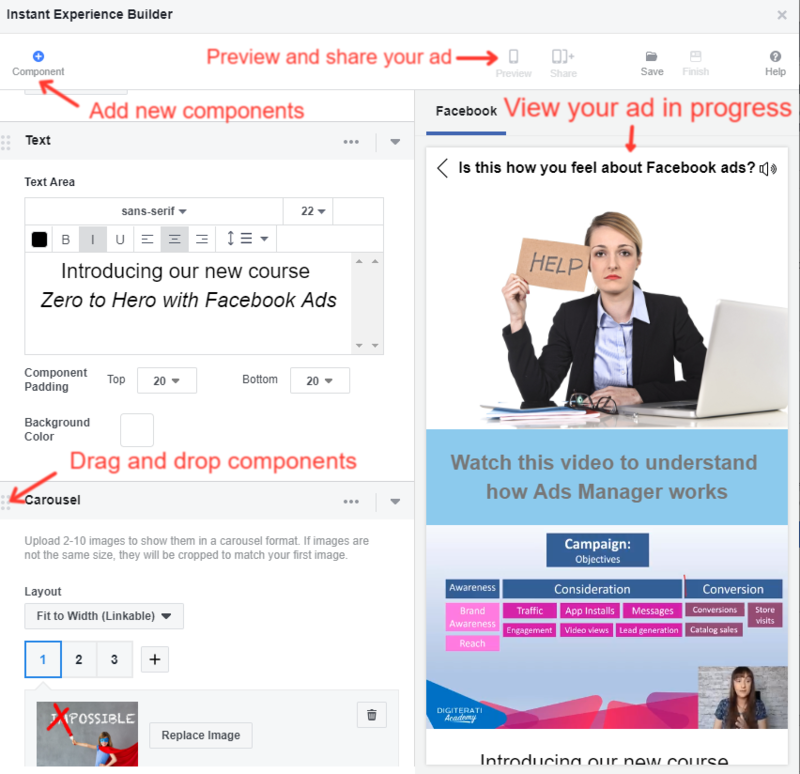 You can create your Instant Experience ads either in Ads Manager or from your Page. 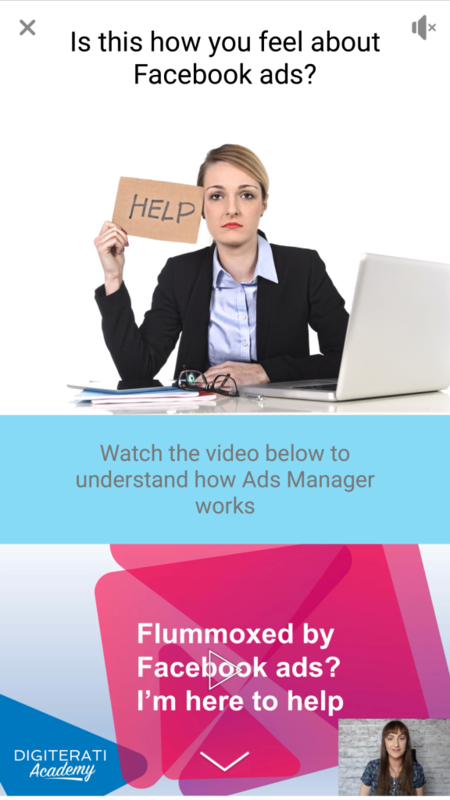 I’m showing you the Ads Manager route. Beneath the Create New tab, you’ll see three templates. Hover over the one you want to create and click Use Template. For more experienced users you can select “Build a custom Instant Experience” (option is listed below the templates). That’s what I did. 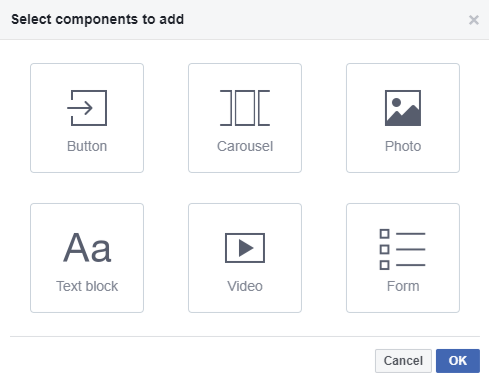 Add your images, videos, text (called components) as you progress with creating your ad. The screen grab below shows you the different components that can be added to your Canvas/Instant Experience. The usual suspects of photos, video, text and carousels are allowed. You can also add buttons (with urls linked) and lead capture forms. There is some formatting permitted in terms of typeface, size, colours, backgrounds and similar. You build the different elements (components of your Instant Experience) in a panel on the left. You can see the ad in progress on the right but best to save then hit Preview to view it on a mobile device. Components can be dragged and dropped into position. 9. Once that is all complete select Save and Finish then progress to the final stages of publishing your ad as usual. This was an ad I quickly pulled together for the benefit of this article. I’ve selected a variety of asset components so that you can see how they look in practice. There are three screen grabs below from mobile which you scroll down to. With time you can make something really creative. I would recommend clicking on the three little dots (…) to the top right of any text or button components. Here you can reduce the “padding” at the top and bottom of each element. If you “lose” your Instant Experience or want to retrieve one you previously created you will find it in Publishing Tools. I would recommend that you get stuck into Instant Experience sooner rather than later. Novel ad types tend to get good traction with users. In trials 53% of users that open a Canvas view at least half of it and the view time is a huge 31 seconds. 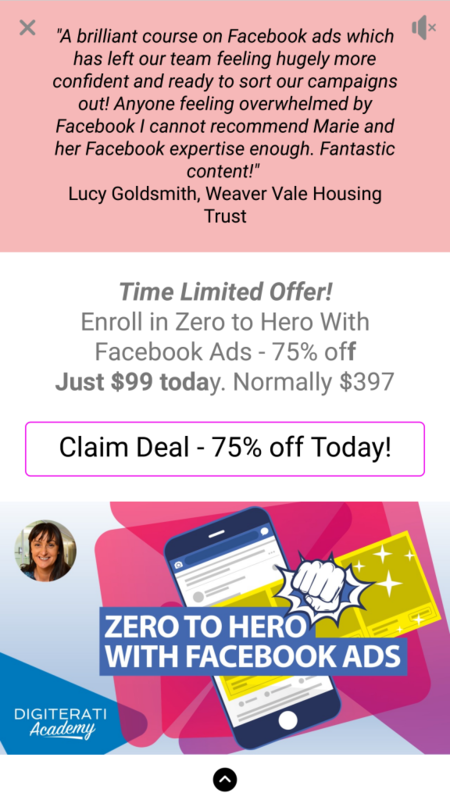 Check out my brand new course ‘Zero to Hero with Facebook Ads in the Digiterati Academy. You’ll fast track all my knowledge of what’s working to create great Facebook ads right now and feel confident in your ability to run an effective campaign.